Our school's curriculum includes the three branches of Chinese internal martial arts as well as elements from other Chinese styles. It is designed to begin with styles that emphasize the basics, which are the core of all martial arts, while teaching application. As the students progress, they move deeper into more internal and advanced material with an emphasis on Martial Values. Students start with Praying Mantis, which teaches Kung-Fu fundamentals and includes movements from many traditional shaolin animal styles. After passing Praying Mantis, students who show enough maturity are eligible to join the Weapons class. In this class we study the main four weapons; Staff, Double Edged Sword, Broadsword, and Spear. From there students learn Tai Chi's first form. This is where students learn to go deeper inside themselves and smooth their rough edges with and emphasis on whole body spiral power. Baguazhang next teaches students to move beyond the straight line to create more circular movements and emphasizes strong footwork. After Baguazhang students return to Tai Chi's second form called Pao Choi, which translates to "Cannon Fist". This is where the power from the earlier forms is condensed into tighter spirals and students learn to apply the power that comes from softness. This is Tai Chi's combat form. Instead of having a typical belt system, students earn patches for their pants showing what styles they have learned. After learning all four styles, they will then work to refine their forms and test for Black Belt. 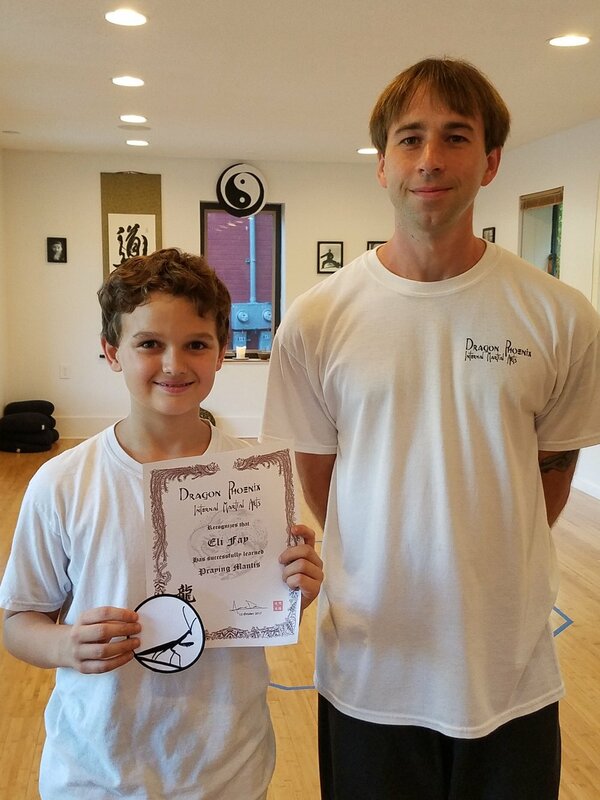 After earning the level of Black Belt, students will be able to enter into the Advanced Class. In this class students will be learning a whole new set of empty hand and weapons forms as well as advanced training techniques. We teach that competition is best with oneself rather than with others. We work to help our Kung Fu brothers and sisters to be their best as well. When we work in harmony, everyone grows and flourishes.